What if dancing could heal the world? This isn’t the tag line to some mid-80s super chick-flick, with Patrick Swayze and Kevin Bacon playing the lead roles of rival gang leaders who need to unite to stop the stunning love interest(played by Molly Ringwald)’s father from destroying the city with dirty energy, all by using the power of dance. Although, let’s be real, I’d watch that film. It’d probably be more enjoyable than Dance Magic, at any rate. The game doesn’t seem to have a story. While Dance Magic’s Steam Store page insists that you “join the battle to stop those who try to use Dance Magic against humanity!”, the actual game-play doesn’t seem to reflect the grand ambitions of Targem Games’ supposed story. There’s three modes; Tournament, Battle and Free Dance. Tournament and Battle adopt the same formula. 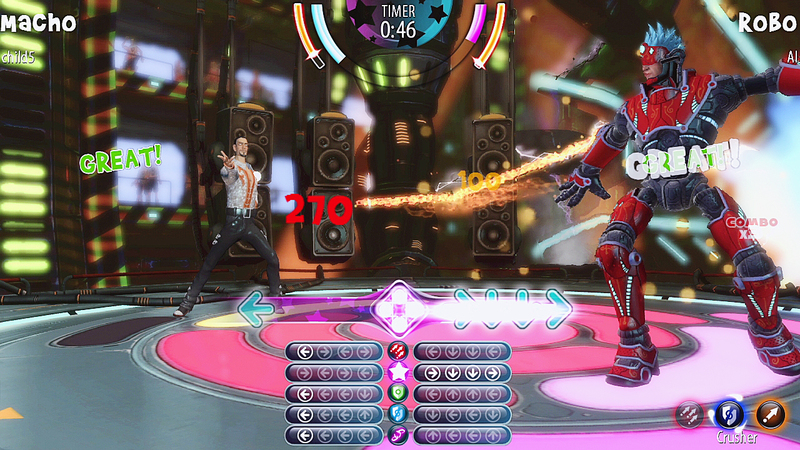 You take control of a character, and go toe-to-toe with an opponent in a dance off. Honestly. There are five different types of attack you can perform, ranging from regular Attacks to Shields and Rage, with each character requiring different input for each of these and having different combos. It’s actually super irritating that every character has separate inputs for each ability (for example, while one might use Left, Right, Left, Right for a basic attack, another could use Left, Right, Right, Left, or something even more different) and the variety in special abilities leads some to be significantly overpowered compared to others. But the battle formula just doesn’t matter. The CPU is embarrassingly easy on it’s lowest difficulty, and ramps up to ‘barely breaking a sweat’ on it’s hardest. I’ve been playing rhythm games for a long time now (cutting my teeth on Dance Dance Revolution, Bust a Move and Guitar Hero), so maybe I’ve come in to Dance Magic with an unfair advantage. 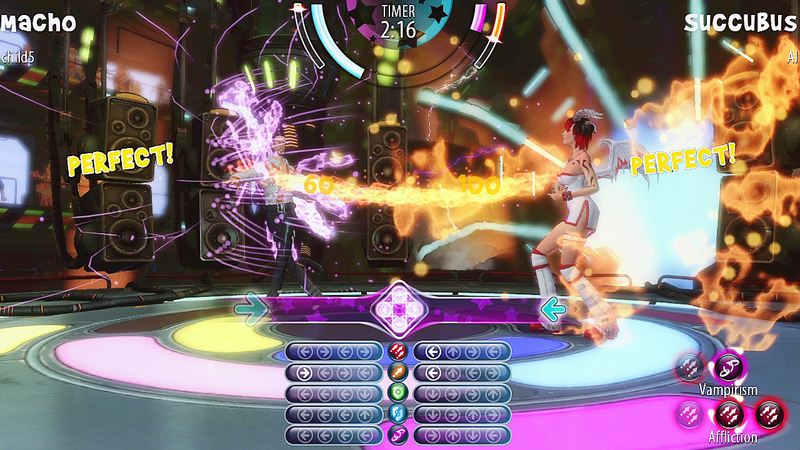 Maybe for a more casual player, Dance Magic’s difficulty curve would be more testing. You might think, “But surely you can take the battle mode online, to play against other humans? Seems only logical!” And you’d be right. But nobody else is playing the game. Ever. There’s a few posts and videos in the Community Hub about it, but every single time I tried to find an online game, in any mode, I instantly received “No servers found. Try again.” In fact, looking in to the numbers, the highest amount of players Dance Magic on Steam has ever had online at once is 8 since it’s launch on February 15th. Hardly a thriving community. 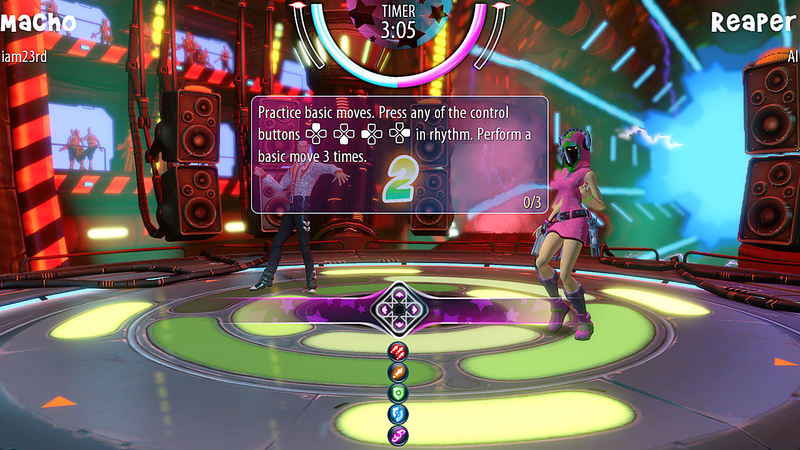 The third game mode, Free Dance, is more reminiscent of classic rhythm games that seem to share a theme with Dance Magic, but without the same skill ceiling. You need to spend a decent amount of time to unlock all the songs, but none of them are super challenging, even at higher difficult levels. My major issue with this game mode was that the notes were static, rather than scrolling towards a bar that showed you when to hit them, a la Guitar Hero. Instead, the bar drives down the screen, and then pops back up to the top when it hits the bottom. Dance Magic claims to boast a “rich character customization system” but I think that’s pushing the boundaries of the word ‘rich’ somewhat. Sure, you can change your the colours and textures of your various characters clothes, but that’s it. I’d accept it as more varied if you could choose your own colours using a slider, but instead you get a handful of options for each category, such as hat, trousers and shirt. 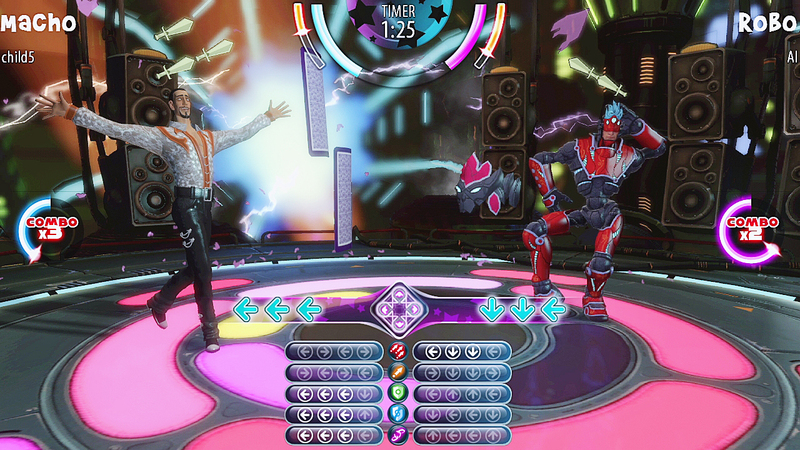 Each character looks different enough from each other to be told apart, and they do indeed have a unique dancing style, but it has literally no impact on the game. 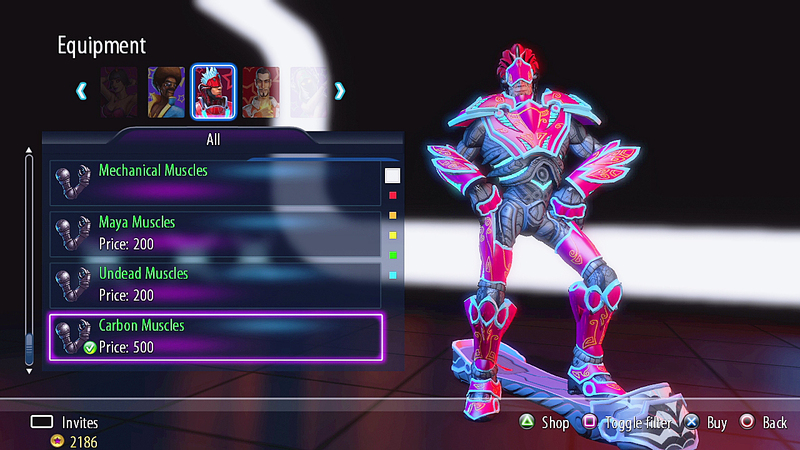 The character you choose effects your combo’s and special abilities in Battle Mode, and that’s it. It’s worth noting that while the game’s set-list is tiny, and full of music you’ve never heard of, you can upload your own songs. It’s a matter of copying the MP3 file into the game’s files, then calibrating the BPM by yourself. The last thing to talk about are the graphics and, considering Dance Magic was build for the PS3, it was bound to look good. 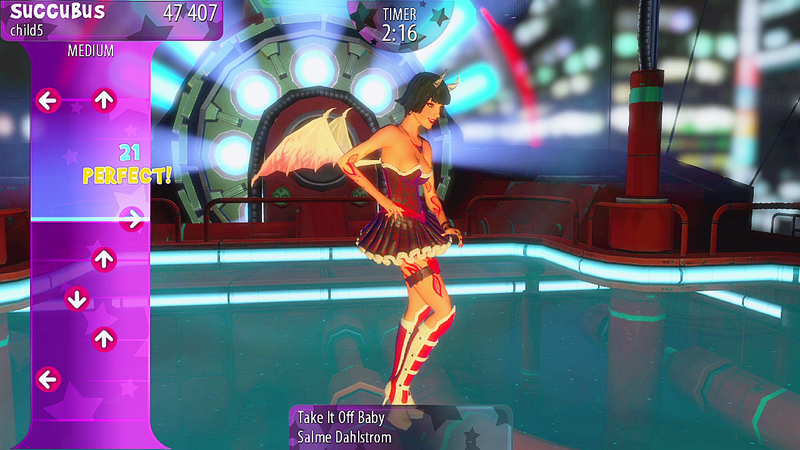 The cartoony graphics are bright and colourful, with some admittedly cool stages for you to dance on. As previously mentioned, the character designs are over the top and exaggerated, but it works for the game. It’s about the only thing that does. 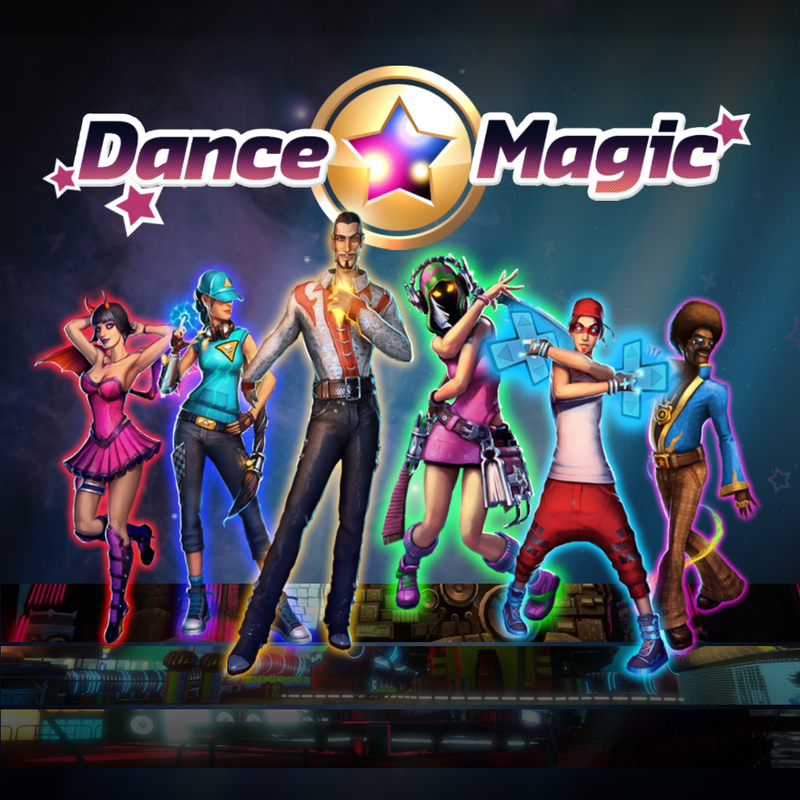 Dance Magic is £6.99 on Steam. Audiosurf is also £6.99 on Steam. Buy Audiosurf instead.